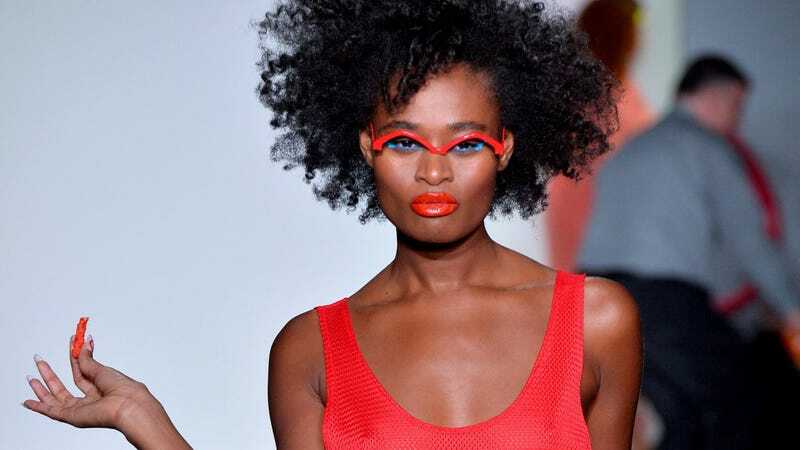 I looked for Anna Wintour’s cell number in my contacts but I guess I misplaced it, so I’ll just direct this shouting to the whole internet: Why the hell are Flamin’ Hot Cheetos on fashion week runways? I was cool with the idea of Guy Fieri-esque flames adorning $750 sweaters, but then, Fashion People, you started strapping Cheetos to models with bungee cord. I am bewildered. Apparently the fashion world thinks the look is cool, though: Twitter reactions were largely positive. Maybe these people just need more snack foods in their lives? I am willing to concede that perhaps—just perhaps—I am not a fashion authority. As I type this, I’m working from home in men’s size large Cabela’s brand flannel pants and not even eating Cheetos. How unhip of me.